Windows on this side face 71st Street. Windows facing the camera face Central park. The 12th and 13th floors are shaded and labeled. 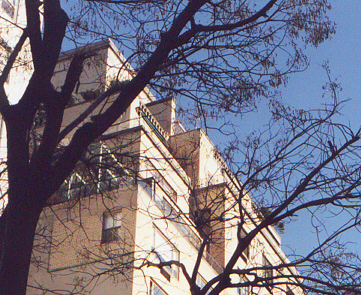 The location of the Caulfield's building took some figuring: the twelfth or thirteenth floor (p. 88: "twelve stories" refers to either their floor or the flights of stairs he climbed) of a residential building on 71st Street (p. 118), and right off Fifth Avenue (p. 67: from a window at home, he could see Phoebe cross Fifth to get to the park). Now, the buildings on the south side of the intersection of 71st Street and Fifth Avenue are way too short. The building I focus on is 3 E. 71st Street. The building just to the left (west) is not on 71st. It is on Fifth (900 Fifth). I think that the next building east (not visible in the photo) is too far away. He watched his little sister crossing Fifth and considered how to describe her. He'd have to have been closer. This photo is taken from the intersection of Fifth and 71st. You can see there is a dark little window on the 12th floor that looks out toward us and Central Park. Its view of the intersection is basically unobstructed. There are also windows on the 71st Street side. If it was was the 13th floor, it's likely that the tree branch on the left only obstructs the view where I happened to be standing. I am convinced that Salinger either knew this building from personal experience or found it, as an outsider with an imagination, to be a suitable building for them. This building isn't very swanky, nor old and elegant with high ceilings and marble (note: I am sure it could be 50, even 80 years old). It is almost humble, which fits his description of his mother especially, who he could imagine doing a charity collection (p. 114). Their building does have a doorman, and, at the 11th floor, the building exterior starts receding and there appears to be balcony/gardening area on the 11th and 13th floors. I didn't go inside the building. An awesome thing is seeing the big, swanky neighborhood that is very nearby. The next street east from Fifth Avenue is Madison Avenue, which is full of exclusive little shops, jewelry artisans and high priced stores for shoes and little restaurants. Yet there is also a church (Episcopalian) on Madison and 71st. The sidewalks are less crowded and much cleaner than those in midtown, where I stayed, which is pretty nice itself. I was wearing my red jacket that day, which is a bit dirty, and a passing guy gave me a disapproving look. Once in a while, you see people with their little kids. The kids have clean faces and wear nifty little outfits. I imagined they had nannies. I had seen a show the first night which involved a lot of comedy with the audience, many of whom were New Yorkers (offsite link: http://www.dameednaontour.com). The audience met Bob and Gwen, who live on the west side of the park, and who have young daughters and a nanny from Guyana. There was a fifty year old woman, Jeanie, who is retired and living on the east side of the park. She used to design hand bags but "got sick of it." Dame Edna (the star) sympathized, "Oh, you do, though, don't you? Get sick of it.." Not very many people have the option to live in New York and to live well: have nannies, retire early. It's an exclusive circle. Holden doesn't talk about his life in New York as being in his unusually well off neighborhood except that he goes someplace swanky for lunch once in a while and that he hates Madison Avenue busses (pg. 114, 130). But he does have a wealth of fond memories of the park (and he goes nightclubbing in Greenwich Village). Later, I continue with more thoughts about the significance of their home's location.